Mexican food. Images of greasy, messy, absurdly delicious tacos and burritos come to mind. Or maybe the chips and salsa at Margaritas. Rice, beans, avocados, tortillas- they are all delicious and all an integral part of Mexican cuisine. But the flavor, the history, the real Mexican food is as diverse as is the country itself. The richness and complexity of some of the sauces will amaze anyone, and if this recipe doesn’t prove it to you, wait for my Mole recipe to come. Carnitas, done right, are a food of love. 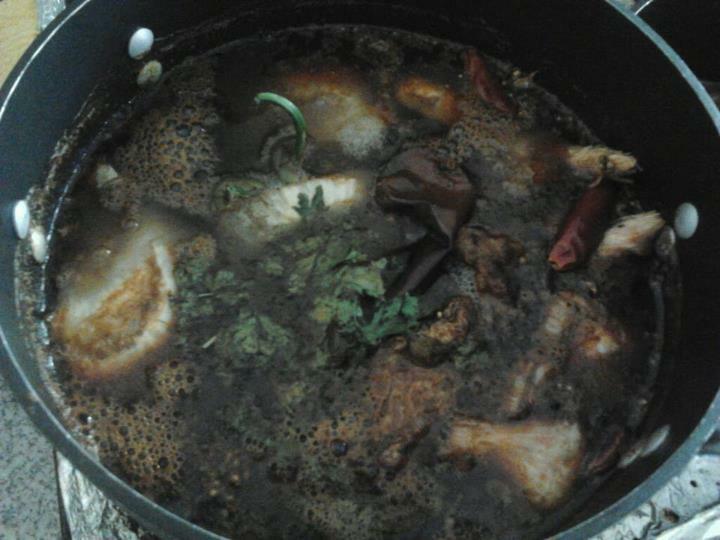 The smell of simmering carnitas alone is enchanting.. They take hours of cooking, balance of flavor, and a real love for the process, but are worth every painstaking second. Traditionally, they are pork simmered in seasoned oil. Because I want to keep my arteries from totally clogging, I use a highly seasoned broth. This is not a difficult recipe, and it will show you, if you didn’t already know, how wonderful authentic Mexican cuisine can be. Cut the pork off the bone into pieces 2 in by 2 in. Marinade the pork (including the bone) with chile powder, garlic powder, onion powder, lime juice, salt and oil. Let sit, room temp covered for 30 min. In a heavy bottom saute pan, sear the pork in a little vegetable oil over high heat, turning occasionally until all sides are deeply caramelized. Drain. In a large sauce pot over med high heat, add 1 tbsp oil, the onions and garlic and cook until fragrant. Add chicken stock and all other spices and ingredients. Add the pork and add water to completely cover. Add a decent amount of salt and slowly simmer for approx 5 hours, or until pork is falling apart tender. Remove the pork. You can serve as is, or hold warm, strain the stock and reduce until sauce consistency (note, if reducing, use MUCH less salt initially, due to concentration of liquid). I like to serve this simply with steamed rice, pinto beans, salsa fresca and guacamole. It also goes exceptionally well wrapped in tortillas (which, along with tomatillo salsa, is the traditional method).